Denise Covey: #IWSG post - BOOK TITLES or CHARACTER NAMES - Nah, let's promote much-loved blogger C. Lee McKenzie's new book instead! #IWSG post - BOOK TITLES or CHARACTER NAMES - Nah, let's promote much-loved blogger C. Lee McKenzie's new book instead! Welcome to the #IWSG for June. Hope your month has been awesome and you got plenty of writing done, whether outlining your next book, writing your current book, or planning your series. Thanks to Alex's awesome co-hosts for the June 6 posting of the IWSG are Beverly Stowe McClure,Tyrean Martinson, and Ellen @ The Cynical Sailor! Thanks for taking the time to help out, team. I hope you get lots of visitors today. So much to do, so little time. Which brings me to the June 6 question - What's harder for you to come up with, book titles or character names. Well, my response to that question was a bore a minute, so I was waiting for some inspiration for my post, when I caught on L Diane Wolfe;s FB timeline that C. Lee McKenzie, that much-loved blogger has lost her husband just as she launched her latest book. Several bloggers have come to the rescue as C. Lee is hardly up for book promotion. I'm honored to do something that may help C. Lee (I call her Clem) at this time. Now I hope you'll give C. Lee's new book a look! Our thoughts and prayers are with you and your loved ones at this time, C. Lee. 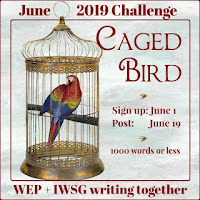 If you feel like a writing challenge to refresh your writing, please join us for the June WEP challenge which opened for submissions on June 1st. 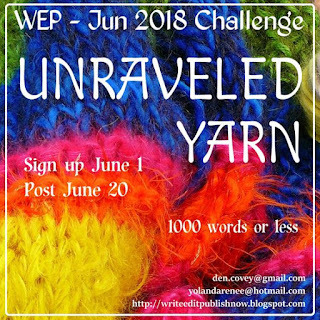 Unraveled Yarn! No, we’re not necessarily talking knitting and crochet. A yarn is a long and rambling, often improbable, story. But we’re not talking long and improbable, a crisp and convincing flash in whatever genre you choose is what we’re after. We are open to everything, except erotica. Serenity, meet Disaster. A lie found out, the unpicking of a tall tale. A crime taking an unexpected turn. A bad-hair day. An ordinary walk spiraling into a crisis. A romantic encounter ending in chaos. Take your pick with the unpicking. And have fun! And get feedback on your writing! I'd say you were inspired after all. That was nice of you to help Lee. Hope it's a good turnout for WEP. My pleasure. I hope we do too Alex. Thanks for your support. Thank you so much for sharing Lee's book. So glad you're spotlighting Lee today. I'm spotlighting her book too and have been doing so in my book giveaway hops because it reaches other people. You did a beautiful job of support, Natalie. It's good to rally around a fellow writer. I was lucky enough to get an advanced copy so I can add a review to Some Very Messy Medieval Magic as well as promote on my blog. That's great Tamara. Just came from your site. You did a great job of support. Lee's book looks like a fun read. Yes, it does. Can't wait to read it. Love the support. Isn't this such an amazing community we're part of? This is a great community Crystal. The book sounds like an interesting read. Nice to see the support. A spate of sad news in the blogging community lately. Yes, there is. Good when we can help. Wonderful of you to support Lee in this way. Beautiful picture of Nice. No problem, Joy. Thanks. Love Nice. Great support indeed for Lee. The cat and Pat both have their WEP entries ready to go. I gathered that Pat. You sure are smokin'. It's been great to see such support for Lee at such a difficult time. The book sounds fun. It does. Can't wait to read it. I'm blown away, Denise. I didn't expect to find this here today, so it was a double fudge sundae surprise. Thank you for being such a great supporter in a time of need. I'm an elephant when it comes to things like this; I never forget. 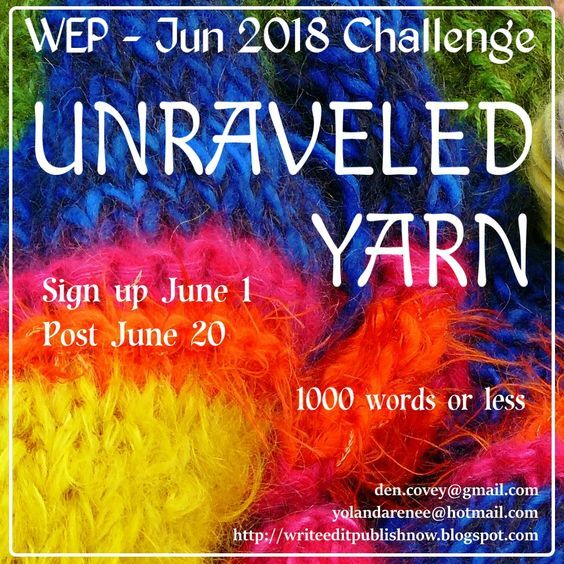 I signed up for the June WEP, and really want to come through with something. I love the theme. Hey Clem, LOL. Hope you're coping okay. My heart goes out to you. Promo-ing Medieval Magic is one tiny way to help. 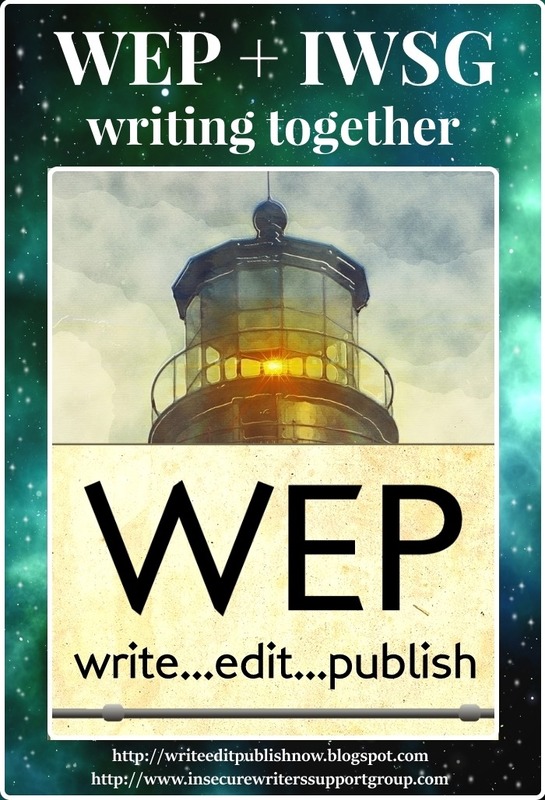 Thanks for joining WEP this month. Awesome! 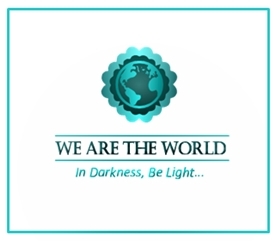 Excellent Lee's signed up for WEP - my brain is in one of its drive ... might be neutral right now ... we shall see!! Hi Hilary! Lee is getting lots of support which is great for such a lovely lady. Glad you're turning up to WEP this month. Missed you last time! Yep, the writing's going well. You're a special person, Denise. Best wishes and massive prayers for Lee. Thanks Lyn. so are you! Lee has lots of support which is lovely. Beautiful post. I'm so excited about "Clem's" book. I send her my prayers nightly. That's lovely of you, Holly. So sorry for C Lee's loss. I've got my Yarn started. Gotta see how to make it flow now. So much support for Clem. It is great that so many people help Lee in her time of pain to promote her book. You're a true friend, Denise. I'm sure Clem appreciates the support. Best wishes to c. Lee McKenzie and her latest and greatest. I need to do shout outs for her. That would be lovely, Stephen. It's great to see the support and love for Lee throughout our community. Yeah, I used to knit, but now I'm too busy writing. I'm seeing Lee's book everywhere so the writing community is really pitching in. God Bless her! Thanks for sharing, Denise! It's great to see the support for Lee. How are you? It's been a while since we chatted. It's really heart-warming to see the community rally around Lee, who needs every ounce of support she can get at this trying time of her life. Since I've read the first two books in the Pete and Weasel trilogy, I'm looking forward to reading SVMMM, and will probably do so during our three-week mid-year school break, coming up towards the end of June. During that time, I also hope to get back to a writing schedule of sorts. Maybe work towards another #100words100days challenge, which was really great for me, in terms of getting new words down. Editing/revising? That's another story for another day. How's the Paris story taking shape? I love that picture of Nice. Really serene. What's new with your writing projects, Denise? We all love Clem and what she does for the community. It's a pleasure to help her in my small way. 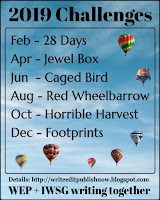 I've stopped these challenges like NaNo which means I just have a whole pile of rubbish to sift through - and I may one day. Meanwhile, I'm ploughing through Book Two of my Vipunin trilogy. Great having my critters by my side to help with the plotting and ideas. 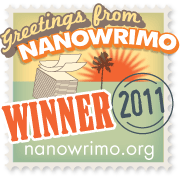 I'm still a slow writer, but I'm getting faster. My Paris story is with Avon, but I'm thinking of self-publishing it after some rewrites now that I'm learning about marketing. That's so good of you to promote Lee's book. I saw the trailer for it and it looks like a great book. Love your picture of Nice - gorgeous. Best of luck to Lee!